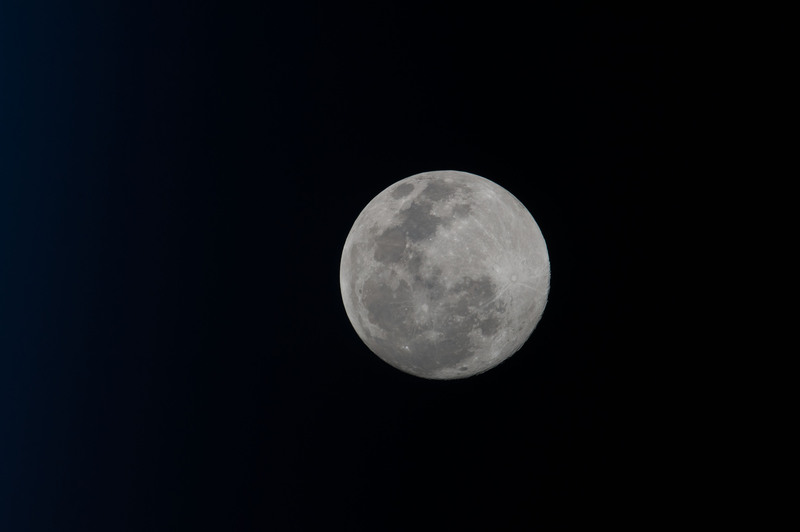 The full moon is pictured from the International Space Station. The Expedition 52 crew members pulled out their medical hardware today for a variety of eye checks and other biomedical research. The station residents are also making space and packing up gear for next week’s cargo delivery aboard the SpaceX Dragon. The crew each participated in a series of eye exams throughout Thursday working with optical coherence tomography (OCT) gear. OCT is a medical imaging technique that captures imagery of the retina using light waves. A pair of cosmonauts then peered into a fundoscope for a more detailed look at the eye’s interior. The regularly scheduled eye checks were conducted with real-time input from doctors on the ground. SpaceX completed a static fire test of its Falcon 9 rocket today at NASA’s Kennedy Space Center. The Dragon cargo craft will be perched atop the Falcon 9 for a targeted launch Monday at 12:31 p.m. EDT. Once in space, Dragon will conduct a series of orbital maneuvers navigating its way to the station Wednesday morning. Finally, Dragon will reach its capture point ten meters away from the complex. From there, astronauts Jack Fischer and Paolo Nespoli will command the Canadarm2 to reach out and grapple Dragon. Next, ground controllers remotely guide Dragon still attached to the Canadarm2 and install it to the Harmony module. The crew is clearing space on the International Space Station today and packing gear to stow on Dragon after it arrives next week. NASA TV begins its pre-launch coverage Sunday covering Dragon’s science payloads. Monday’s launch coverage begins at noon. NASA TV will also broadcast Dragon’s arrival Wednesday beginning at 5:30 a.m.
Great stuff. Thank you for sharing with us non-scientific types. Completely readable. I would like to receive, if possible, regular information on the work and life of the astronauts on the Space Station. Thank you.